One of our all-time best-selling cigar assortments, the Acid Collector Tin sampler showcases 14 of Acid's most popular cigars in a cool and collectible camouflage tin. These cigars are handmade in the traditional Cuban way with select tobaccos, flawless wrappers, and one of a kind infusions that give them a truly unique taste. This is a great way to get introduced to the Acid collection. I really enjoyed these cigars. Big fan of the blue labels from Acid. Lets me get a great idea of which cigars I really like. 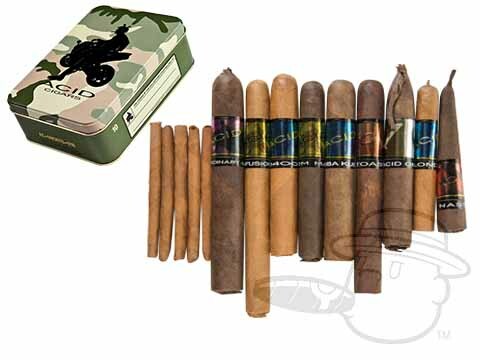 Great group of cigars to get started on Acid cigars. Always a favorite. The Collector Tin is not only a great package it contains great cigars. A wonderful example of what my personal favorite, Acid, has to offer. I didn't know much about ACID cigars walking into this purchase. The descriptions and reviews told about their aromatics and flavor profiles. Basically these boil down to sweet, sweeter, and sweetest. I would recommend this pack to a swisher sweet smoker converting to hand rolled long-filler cigars. My favorites were Toast, One, Nasty, and Kuba Kuba. One is pretty good, Nasty is right up there with it, although I was not a fan of the shape. Toast and Kuba Kuba have enough good flavors to offset the sweetness. The rest taste like 50 ring swisher sweets in my opinion. I Like a sweet cigar every once in a while, but know what you're in for with this ACID sampler. I like every stogie in this tin My favorites were Acid Cold infusion tea and Acid Nasty Maduro. The box is a bonus. Well packaged and nice box for whatever. I put them in my humidor and going to use the tin for stuff. One of my first purchases as a new Cigar smoker. Loved them all except the Blondie. The Toast was my favorite. Have bought it twice, would buy again. wonderful product, great price, and quick shipping. i would definitely order this again. customer service is also on point. This collector tin is well worth the money. If you have ever had an Acid and are curious as to what else Acid has to offer, look no further. Out of them all the Acid Extra Ordinary Larry was the only one without flavor infused; but trust me, it still had the signature Acid smell. Short story -> Worth it. I really liked the sampler pack. Buy these for my Boss for him and his Uncle...they love the selection, but, prefer the Toast and Cold Fusion most! The only flavored cigar I like, and I like all of the them in this sampler tin. Acid products are all great. Well constructed, steady smoke and all have great flavor. Up til now the Padron 7000 maduro was my daily cigar. Now it is the Acids. They are rolled with leaf tobacco, no chopped up bits. They have an easy draw with a beautiful wrapper (I like the maduros). The Extraordinary Larry is the best treat of all, but they are all fantastic. Great sampler. Had a wedding cigar bar, these cigars went over very well for all experienced levels of cigar lovers. Must have collection in the humidor. I love the variety and great value. Loved everything about it. Like the Acid brand and started with a Blondie and now the Kuba kuba is my fav. Wanted to try other Acid cigars and the only ones I didnt mind were the c'notes. Cant wait to try others. Like a sampler with Blondie maduro. Haven't tried that yet. They manage to cram in to this cool little tin a taste of almost everything ACID offers. It was a great journey through their line. I even bought on for my friend just getting in to cigars now. BCP had item I wanted in stock (a few otther places didn't). Item arrived when expected and cigars are great. Will order from BCP again. Acid Collector Tin - 14 Cigar Sampler is rated 4.6 out of 5 based on 51 customer ratings.